What are English morphemes, and why do they matter for spelling? At the start of each year, to the delight of Aussie word nerds, the Macquarie Dictionary announces which new words have come into common usage in the previous twelve months, and gives us all a People's Choice vote on the Word of the Year. Of this year's crop, I enjoyed "flappity", "mansplain", "voluntold", "job stopper", "bamboo ceiling", "wikiwash", "mandal", "facekini", "normcore", "decision fatigue", "doge", "compassionista", "precariat", "girlie man", "lifehacking" and "dog surfing", but having had to deal with more politicians, planning bureaucrats and property developers than is really recommended for one's good mental hygiene, would give the gong to "ICACable". If you're a native speaker of English and you haven't been living under a rock, you can probably take a reasonable stab at the meanings of many of these words, because of your knowledge, or ability to infer, the meanings of their components. This is especially true if I put them in sentences: "The teenagers became flappity as their idol's limo approached", "Yes, dear, I got two distinctions for statistics at uni, no need to mansplain", or "The whole department was voluntold to help out on Open Day". Even though "ity", "splain" and "volun" aren't words in their own right, they are used here as meaningful word parts, or morphemes, to build the new meanings. When you know the suffix "able" and that ICAC is the Independent Commission Against Corruption, if I say, "The former Minister's relationships with the property industry are very ICACable", you will understand me perfectly. In linguistics, morphemes are the smallest meaningful units in a language, and are used to build word meanings as well as their structure. The study of morphology is separate from, but of course related to, the study of phonology (speech sounds), syntax (word types and their use in sentences), semantics (meaning) and pragmatics (language use in context). Knowing a bit about morphology can help with explaining and demonstrating spelling patterns to kids, so let's have a go at it. Many English words cannot be broken up into smaller meaningful parts, for example, "cat", "swim", "and", "the", "red" and "when". 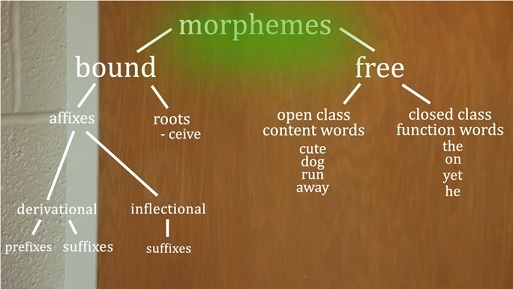 They contain only one morpheme, and since they can go out on their own in sentences, are called free morphemes. "And" joins words and sentences. "The" indicates a specific, known noun e.g. "a moon" could be anywhere in the universe, but "the moon" is the one that goes round the earth. "When" is a conjunction or adverb about time. We don't make up new function words like these, and it's quite hard to explain what a lot of these words mean. They really only make sense when used in sentences. The rest of our words are content words with a semantic purpose. They carry the main meanings we are talking or writing about, such as "cat", "swim", "red" and "always". We can and do make up new content words all the time, and if they catch on, dictionaries catalogue them and they become part of the language. Many English words are made up of two or more meaningful parts, for example the words "catty", "swimming" and "reddest" all contain two bits of meaning. The "y", "ing" and "est" are bound morphemes, which need to be attached to another morpheme before they become a word, and can go out in sentences. Some of our bound morphemes serve a syntactic purpose i.e. they inflect nouns, adjectives or verbs. Since English puts these only at the ends of words, not at word beginnings, these are called inflectional suffixes. Plurals: show there's more than one of something. The usual plural morpheme is "s" or "es" e.g. cat-cats, dog-dogs, witch-witches. However, sometimes we form plurals in unusual ways, in words that come from Old English, Latin or French e.g. mouse-mice, child-children, radius-radii, phenomenon-phenomena, genus-genera, larva-larvae, bureau-bureaux etc. Click here for more examples. The possessive: shows that something belongs to a noun, and is written as an apostrophe + "s" e.g. the frog's leg, the city's skyline, the cat's pyjamas. If we are talking about two frogs having four legs, we just add a possessive apostrophe after the plural "s" ("the frogs' legs). The comparative: is used to make adjectives that compare things, and written "er" e.g. funkier, lazier, redder. The superlative: is like the comparative, only moreso, and written "est" e.g. funkiest, laziest, reddest. Third person singular present tense: is the "s" verb agreement in "she sleeps", "he wakes" or "it lurks". Simple past tense: is usually "ed" as in "it lurked" but we also have many irregular forms from good old Old English, like "she slept" and "he woke", where it is hard to say which bit of the word is the base word and which bit is the past tense, but there are still two meanings and therefore two morphemes. Past participle: usually "en" as in "she has chosen" or "he had woken" or "ed" as in "they have danced" or "we have smashed", but there are again many irregular forms e.g. "I have slept", "you had crept" etc. There are many lists of irregular simple past and past participle verbs on the www, click here for one from the British Council. Present participle: the "ing" that shows continuous action e.g. "she is carousing", "he was prancing". Note that these "ing" words can be used as adjectives e.g. "The prancing pony", or they can be used as nouns e.g. "Prancing has worn me out". "anti" before a noun adds the meaning "against" e.g. antiwar, anticlimax, antidote. "omni" adds the meaning "all/every", as in omnivorous, omniscient, omnibus. "ist", "ian" or "eer" after a noun to add the meaning "one who…" e.g. pianist, dramatist, optometrist, politician, magician, musician, mountaineer, musketeer, engineer. "vore" after a noun adds the meaning "eater", as in carnivore, herbivore, omnivore, locavore. "gate" has within my lifetime become a suffix which turns a word into a scandal, as in Watergate, Camillagate and Wormgate (an Australian federal election debate controversy). "ity" after a verb to make it into a noun e.g. prosperity, equality, security. "un" before a verb to reverse its action e.g. undo, unpack, unlace, unwind, unpick. "ly" after an adjective to make it into an adverb e.g. kindly, quietly, aggressively. "ous" after an adjective to add the meaning "full of" or "possessing" e.g. joyous, nervous, spacious. Both inflectional and derivational affixes are used productively to make new words. Children typically experiment with them a lot when learning to speak, making cute mistakes, e.g. "I runned and falled over", "It's the funnest", or "I scratched my legpit". Adults sometimes deliberately get them wrong for comic effect e.g. asking whether you've squozen the oranges. These affixes also tend to have predictable spelling patterns, so that once you know how build words in spoken language using the suffix "ful", and you know how to spell words like "fearful", "joyful" and "wilful", I can tell you about something "squessful" and ask you to write it down, and you'll put FUL not FULL, FEL or something else. People learn the affixes in spoken language naturally, because that's how our brains are wired, but major spelling patterns like this should be taught, because spelling is a learnt skill, not a natural process. There are a further set of morphemes in English which aren't words by themselves, but do carry specific meanings, and which can be made into new words by adding one or more prefixes or suffixes. These are called bound stems or word roots, linguists being rather keen on trees as metaphors for language structure. For example, the stem "tele" means "far off" as in "telegram", "television" and "teleport". The stem "phon" meaning "sound" gives us "phoneme", "euphonium" and, if combined with the stem "tele", "telephone" (a bit like a compound word, but made out of two stems). The bound stem "vac" means "empty" as in "vacuum", "evacuate" and "vacant", even though it is not pronounced the same in all three. English tends to keep stems spelt the same even when their pronunciations vary considerably, think of the "anthrop" (meaning "man") in "anthropology" and "misanthrope". So it's useful to be taught some of the most common bound stems. We get the word "Thursday" from the Old English words meaning "Thor's day" (Thunresdaeg), Thor being the Germanic god of throwing hammers across the sky, creating thunder. To most of us "Thurs" is now just a stem that is part of the name of a day, it's not a meaningful unit like "birth", "dream", "light" or "holy" which we combine with "day" to get "birthday", "daydream", "daylight" and "holiday". If I said, "I'm having a little Thursmo" or "I'm feeling Thursish" you'd probably conclude I am a bit midweek-weary, and wish the weekend would hurry up and come. You wouldn't expect me to start throwing hammers round the office. Words that are in current English made of two or more morphemes can also sometimes be cropped but still carry the meaning of the longer word, which is how the prefix "diss" came to mean "disrespect". But this same cropping also happens to single-morpheme words e.g. "bro" was cropped to"brother", and is now being used as a morpheme in its own right, in words like "bromance". Former Latin Masters and self-styled Language Mavens (let's call them FLMs) like to devise tests containing questions like "what does 'alb' mean?" which are supposed to elucidate who has had a Really Proper English Education. I think of these tests in the same category as the 1930s Australian immigration department language test, which was a dictation test. If the immigration officer wanted to exclude you, but you spoke English and all the other major European languages, the test could be administered in Scots Gaelic (click here if you don't believe me). To answer the FLM test question "what does the English bound stem "alb" mean? ", you either have to know some Latin or a derivative language like Italian or Spanish, or you have to think about what words in English containing "alb" (albino, albumen, albatross, albedo) have in common, while ignoring unhelpful words like "albeit", "balboa" and "album" (unless you know the first albums were white tablets on which events and names were written) and be able to isolate the common thread in meaning. This is hard, and young children can't usually do it, plus whether in real life it helps anyone to know that "alb" means "white" is kind of arguable. It's not widely used to make new words, though if there is a sudden upsurge in the need for unique URLs in the dairy, detergent or dental industries, it might be. There's no morpheme "tross" meaning "bird" or "fly" or "burden". So to most of us, the English word "albatross" contains only one morpheme. Which morphemes to teach, when? With an overcrowded curriculum and diminishing marginal utility on some content, teachers wanting to teach spelling in a logical, patterned way need to decide which morphemes to teach, and in what order. Without a whole-school spelling/word study curriculum which knits phoneme-grapheme correspondences (like the "ed" in "jumped" and the "est" in "slowest") with the meanings of morphemes (like the "ed" in "jumped" and the "est" in "slowest") there will inevitably be a lot of doubling up, gaps, and confusion. So I'm always a bit surprised how few schools have a whole-school spelling/word study curriculum. I found a great little YouTube video about morphology, which is a lot funnier than the lectures I had about it as an undergraduate, if you have a spare 7 minutes. This entry was posted in new words, spellings on February 3, 2015 by alison. The mathematician in me loves this stuff. But I get confused about a word like “in”. That’s a preposition isn’t it? But how is that not “semantic”? I mean, being in as opposed to being “out” are two different places. No point talking about a box if you don’t know if it’s the inside of the box or the outside. Getting in the box is very different from getting out of the box.